When it comes to traveling through Europe by rail, it’s critical to carry as little baggage as possible. Learn how to slim down your suitcase. There’s no better way to experience the vast diversity of the European landscape than by seeing the continent by rail. 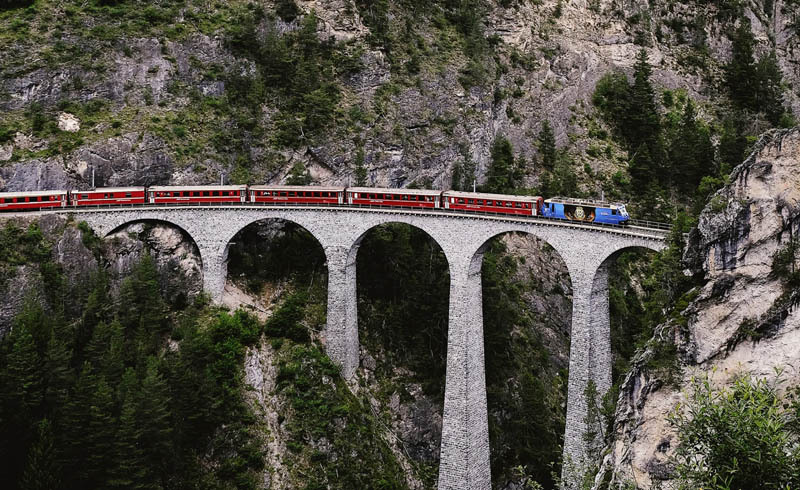 You can ride the Glacier Express in the Swiss Alps, the Jacobite Steam Train (also known as the “Hogwarts Express”) in Scotland, the Bergen Railway through Norway, and, of course, the Eurail through much of the continent—and you're bound to experience the trip of a lifetime without ever stepping foot on a plane. And though it may be tempting to pack freely without the constraints of airline luggage restrictions, it’s important to streamline your packing for train travel, too. Not only will a massive suitcase (or two) be difficult to lift on and off train platforms and to fit through narrow aisles, but it’ll be that much more of a burden when you’re constantly on the go. Bring only what you’ll need and leave the extras behind. Here’s how to make it happen. When traveling Europe via its railways, you may use one pass that’ll take you to multiple countries. That pass will be your lifeline, so it’s important to not only keep track of it, but also to keep it (and your other travel documents) organized, so you can access them and show them to a conductor at a moment’s notice. The RFID Travel Zip Organizer is perfect for keeping your items in one place.. The materials in the organizer block RFID signals to help prevent identity theft, and it has multiple pockets for your rail passes, passport, and cards, and zippers keep valuables secure. Place the organizer in a designated zipper pocket in your carry-on bag for easy access whenever you need it. You can plan all the amazing outfits for you trip that you want, but if you can’t lift your bag onto the train, it won’t matter. And many train companies won’t allow you to carry on multiple bags, so if you want to avoid checking a suitcase, it’s important to choose your luggage carefully. For a trip when you’re constantly on the go, a backpack, which will give you a full range of motion, will be the easiest option. You’ll be able to run after a train if you’re late and go up and down stairs with ease. And depending on the backpack's exact size, you might also be able to store it in the train's overhead bins, rather than on the luggage racks at each end of the carriage, allowing you to keep your bag close to you at all times. The EC Lync™ System International Carry-On is lightweight (only 4 lbs 6 oz/1.98 kgs empty). Use the straps to wear it like a traditional backpack, or pull it by the handle and roll it like a suitcase. Better yet, remove the handle system all together and wear it as a soft-sided backpack. Top and side handles help you easily put it in overhead storage, and compression straps help you maximize that precious space. And if you’re flying into a European destination, you can easily fit this bag on the plane without being charged extra or having to check it. You’ll also want to bring a small bag to hold things like your travel wallet, camera, and personal items like sunglasses or an umbrella, when you’re out and about. I recommend a lightweight bag, like this Packable Daypack. When you’re between destinations, just fold it up and put it in your main pack. When it comes to your clothes, think minimalist and efficient: No matter what season it is, you can always find somewhere to wash your items so you can re-wear them. Pack solid colors that coordinate and items that you can wear multiple ways. Everything you bring should fit into one medium-sized packing cube and one garment folder for your dressier pieces. Limit your shoes to two or three pairs, all of which should fit into one shoe organizer. Toiletry kits will keep your liquids and other items organized, but you don’t need to go overboard. Pharmacies and grocery stores that sell the necessities are easy to find in Europe, so bring only items that you can’t purchase overseas. Pack them in a small toiletry kit that you can hang up in the train bathroom. Your luggage may not be with you at all times (like when it’s in storage on the opposite end of the train), so pack a lock to keep your belongings away from prying hands. For comfort on long train rides—especially overnight trips—bring a neck pillow, blanket, and eye shade. Ear plugs will come in handy, too, to block out the inevitable train noise when you’re trying to fall (and stay!) asleep. Before you head out, check your train line’s luggage requirements to be sure of what you will be able to bring on board. And remember, the less you pack, the lighter your bag is! Do you have any other great packing strategies? Share them in the comments!